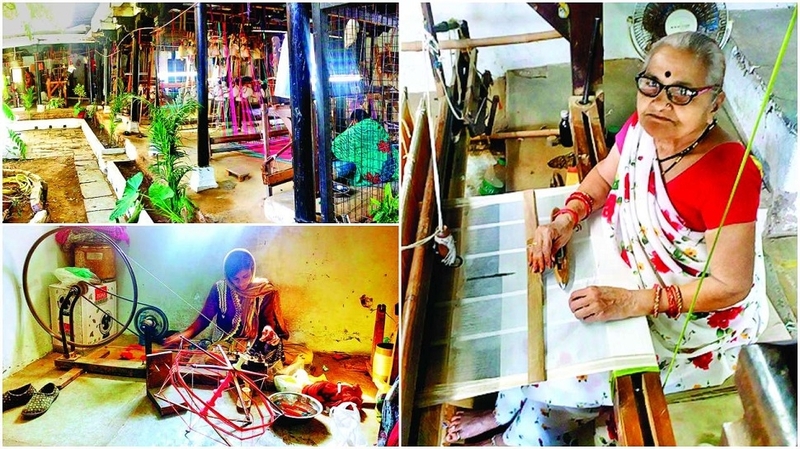 Her 38-year-old daughter, Sangeeta Jethwa, works on a ‘Mala border’ (aptly named for its big wave pattern) on the two-pedal loom next to hers. Jethwa, who has worked at Rehwa for nine years, says, "Some of the experienced weavers recognise the design of the sari just as the dobby loom (wooden notches that control the warp threads) is set.” Another weaver, Kiran Khevat, 31, has worked at Rehwa for seven years and can weave eight saris in a month. Unlike the older weavers, Khevat had to undergo training for only six months. “I didn’t know anything about weaving till I joined Rehwa. But the salary was enough to sustain my kids,” she says. Her three kids attend the Ahilya School, while their family lives in the apartment provided by Rehwa. Apart from providing housing and educational facilities to its weavers and their family members, Rehwa Society also makes provident fund contributions for each employee. With over 75 looms, Rehwa, another name for the river Narmada, employs over hundreds of weavers in their four production houses, majority of whom are women. The men and women have separate working quarters at each production house and work on looms with plaques that pay gratitude to their sponsors like actress Shabana Azmi, Director Muzaffar Ali and even the Holkar family (Maratha rulers of Indore), among others. The traditional designs of the Maheshwari saris - available only in bright contrasting colours of reds, blues, yellows and greens - are mostly left untouched, says the 23-year-old Designer and Marketing Executive Dhanya Kolathur. “I have to be very careful in retaining what a Maheshwari textile is and work within those bounds.” With contemporary designs, Kolathur’s design liberties stretch only as far as not having heavy zari work or adding more geometric borders. Since a typical Maheshwari sari would be made from all natural dyes, Rehwa has started its valueaddition programme like tie and dye and natural dyeing processes, where the dyeing is done inhouse.